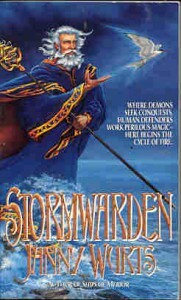 Delightful and rich, this is a high fantasy tale in the best of Janny Wurts’ tradition, so definitely not easy to fit into genre conventions: the story is geared towards a wider audience but it’s not a classic coming-of-age tale or YA in outlook; there are powerful sorcerers and demons, but they are not all-knowing; there is a medieval-flavoured world full of lore and magic, but also intriguing sci-fi elements; the villains are both standard and surprising…the list could go on, anyway the innovation I liked the most (considering when this book was written) is that there is a classic fantasy structure along with a very modern focus on characters’ psychology and morality. While this book doesn’t have the complex upending of tropes or the deep challenge of the reader’s assumptions which I’ve come to love in her later works, Wurts weaves the story with impeccable rhythm, a skillful rising of tension, clear direction and, at the same time, little predictability of how the plotlines are going to unfold. As a fan of [b:The Wars of Light and Shadow|28660|The Curse of the Mistwraith (Wars of Light & Shadow, #1)|Janny Wurts|https://d.gr-assets.com/books/1328835513s/28660.jpg|1945432], I could see in Stormwarden some familiar elements, like sailing, prophecies, good vs evil without clear-cut lines, obsessive compulsion in a perfectly logical mind, empathy, a full-fledged magic system and several aspects of what defines well-rounded and multifaceted characters. Even though the similarities are loose, a long time reader won’t fail to appreciate both the little connections and how Wurts, unfailingly, never writes the same tale twice. In this first book of the Cycle of Fire trilogy I particularly liked the gripping premise and the protagonists, two boys and a girl, all flawed and not all able to make the right decisions at the right time. Their personalities are complex and the result of their strengths, weaknesses and childhood experiences; they have different ways to relate to their mistakes, inadequacies and self-doubts born of tragedy; facing similar challenges and ever-changing circumstances, they have their own personal reactions, from hatred to love, from will to carve a path to the future standing on their own merits to sheltering in self-deception. All, invariably, strive to make their choices count and pursue their own interests as they’re caught in the machinations of the ancient powers vying for supremacy in the world of Keithland. What if they play someone's else game? The themes are mature and the tones are not light, there is hope but also a sense of foreboding and impending doom throughout, and I liked the gravitas of the narration, which is probably the only concession to the ’80s fantasy fashion. As I expected this book doesn’t end with a cliffhanger, but the story is open and I’m really eager to read [b:Keeper of the Keys|28669|Keeper of the Keys (The Cycle of Fire, #2)|Janny Wurts|https://d.gr-assets.com/books/1388813121s/28669.jpg|29184] and immerse again in the tale of Jaric, Emien, Taen and Anskiere. This is an epic story of future and past, of strength that could arise out of weakness, of cross-manipulation, denied dreams, burning ambitions, courage, cowardice, choices and destiny. The world is vividly depicted, no fans of sailing will be disappointed, there are several forms of magic and an engaging mix of action and mysteries. I cannot seem to get enough of Wurts’ characters, creativity, great world-building and design. Her storytelling makes her tales simply different, original, and each a unique voyage.